21 * 16 * 8cm. Small men bag but with large capacity, please confirm the size before buying. Perfect companion especially you don’t want take a heavy handbag. 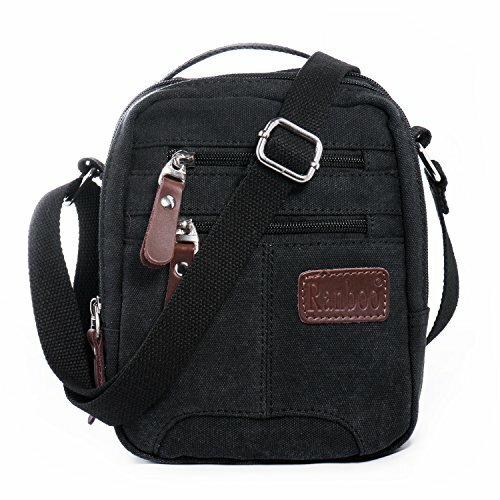 Compact but roomy black canvas bag with lots of useful pockets, totally 7 zippered pockets, 3 open pouches, also with 2 pen holders, 3 inner convenient card slots and a clip for keys. Ignore its little size, you will find it can carry a surprising amount in its many compartments. Made of lightweight but strong canvas, unremovable but Adjustable cotton strap, maximal bag drop: 90cm. All zips with comfortable faux leather pull bring fluent easy asses. 1- Great bag with ample space and compartments holds everything not to bulky and goes with whatever you wearing. 2- Well made with a variety of zipped and open pockets so it will carry a large numbers of items but still remain easily organised. 3- Good bag for nights out if you have to carry things that you can’t put in your pockets. 4- Kinds of occasions: Holiday, walking, trip, work, a day out, sports activities, hiking, camping, fishing, photography. 5- Great little bag, practical and functional. Not only as man bag, also available for women use, work or leisure. 6- Eco friendly canvas fabric, breathable, lightweight and washable to easy to keep clean. 7- Freely wear as cool simple shoulder bag or across the body bag to make your hands free with other affairs. If there’s anything wrong with the product or anything we can do for you, please don’t hesitate to contact us. We will try our best to solve the problem! Thanks for purchasing from Hengying Global! 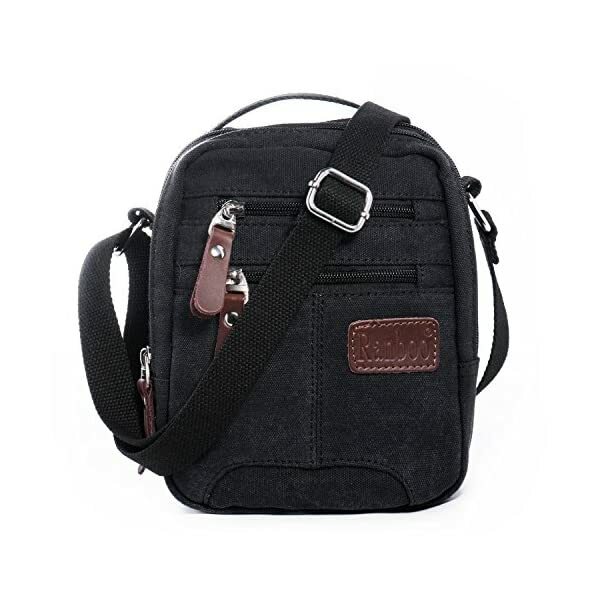 Great bag really useful multiple pockets nice and small, well made looks causal and really good fits over your shoulder nicely. Handy versatile little messenger bag, holds much more than you think, brilliant as days out places bag, flight trip bag, night out bag, every day use bag, dog walking bag, holiday documents bag, to instead of your large man bag! One of your gift choice for friends, husband, dad, brother, son, or other family.